CUPERTINO, California — With the release of augmented reality apps from Apple and Google, there will be a seismic shift in how you use your smartphone, according to experts. Experts say AR will modify consumer thinking and consumer behavior, create new user experiences, and generate thousands of opportunities for businesses to entice you to open your wallet — which is why the tech giants are fighting to take first place. The earliest incarnations of augmented reality have been around since the 1960s. Since then, the technology — which places virtual objects in the real world, a la "Pokemon Go" — has been bulky and costly, requiring its own software and hardware. But in 2017, that's finally changing. "AR is a way you can interact, interface with the world around you," said Tuong Nguyen, principal researcher analyst at Gartner. While the new generation of iPhones may have been the big draw at Apple's product launch event on Tuesday, augmented reality was the star. Apple announced its intention to democratize AR earlier this summer, and with the release of a free iOS 11 software update on September 19, it will be available to the masses. "We can create devices that are far more intelligent, far more capable, far more personal than ever before," Apple CEO Tim Cook said at Tuesday's iPhone unveiling. With Apple's ARkit, and a similar proposition in the works by Google called ARCore, smartphones and tablets are going to be completely transformed. "Apple are the masters of taking a technology that has been around for some time and making it," Geoff Blaber, leader of mobile device software research at CCS Insight told NBC News. Ahead of Apple's Tuesday reveal, some developers and big brands showed off their AR apps. Ikea's version lets potential customers view digital furniture in their real-life space to design their dream living room. If you like what you see, Ikea will let you order straight from the app. Home improvement store Lowe's is introducing "Measured by Lowe's," an app that will let you take real-world measurements, whether it's of a closet or your child's height. Augmented reality can also be used to coach people to complete a task, such as changing a light bulb. Google's foray into the world of AR is available now and will run on the Pixel and Samsung S8, as long as the devices are running the Nougat operating system or newer. When announcing ARCore last month, Google said it hopes to have ARCore on 100 million devices by the end of its preview. While there's plenty of excitement around augmented reality, there's also the question of whether there are any hurdles to getting almost every smartphone user on board with AR. Nguyen said he expects to see some parallels to the adoption of mobile gaming. While game consoles might have been popular with kids and young adults in the 1990s, he made the point that "now everyone is playing" games on their smartphones. He expects augmented reality to blossom in the exact same way. Before Pokemon Go, people didn't think of holding their phone up, other than when taking a picture. That changed the way people behaved," he said. "And it will potentially change the way people view technology and what AR is and should be to them." Of course, getting AR right has taken some valiant efforts and stumbles over the years. Google began testing Google Glass — the geeky augmented reality eyewear — in 2012. However, the first edition of Glass was laid to rest in 2015 after a difficult run that was fraught with privacy concerns over its camera, leading Glass to be banned in some public locations. And those early adopters who wore the eyewear weren't immune from scorn, earning the nickname "glassholes." Google Glass 2.0 returned in July with an emphasis on enterprise customers: DHL is using Glass to scan packages and receive real-time instructions showing where to place them on a cart. This had gotten rid of paperwork and, in turn, increased the shipping company's supply chain efficiency by 15 percent, according to a Google blog post. Another example explained how doctors at Dignity Health can focus on a patient, with a Glass application handling what would have otherwise been cumbersome computer note-taking. Another technology giant, Microsoft, has also been fine-tuning its HoloLens eyewear, which allows the wearer to have a "mixed reality" experience, interacting with holograms and real objects in the physical world. The company has demonstrated a variety of experiences for HoloLens, ranging from gaming to education to creating architectual models. 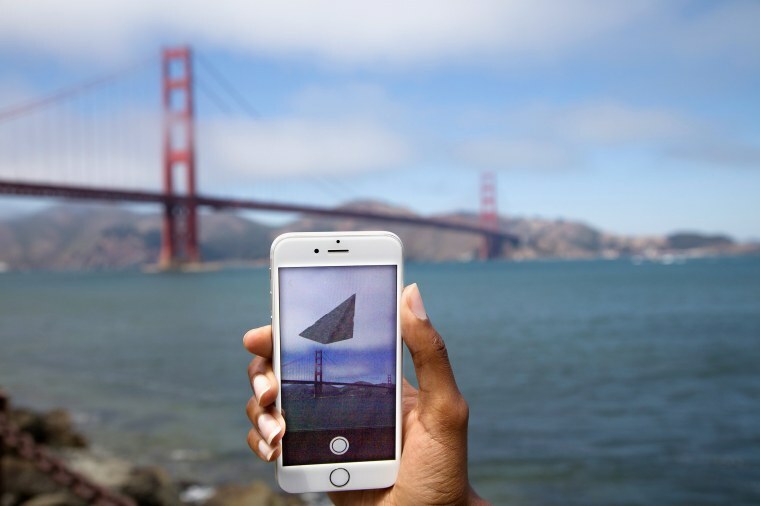 While these two examples show the potential for AR in an enterprise and educational space — and garnered plenty of attention when they were released — Nguyen said with AR coming to your phone, this time it's a game changer. "It is coming to a platform that you already have in your pocket or purse," said Nguyen. With ARkit, augmented reality is "changing what people think and increasing that overall interest. It is raising the tide for the industry."